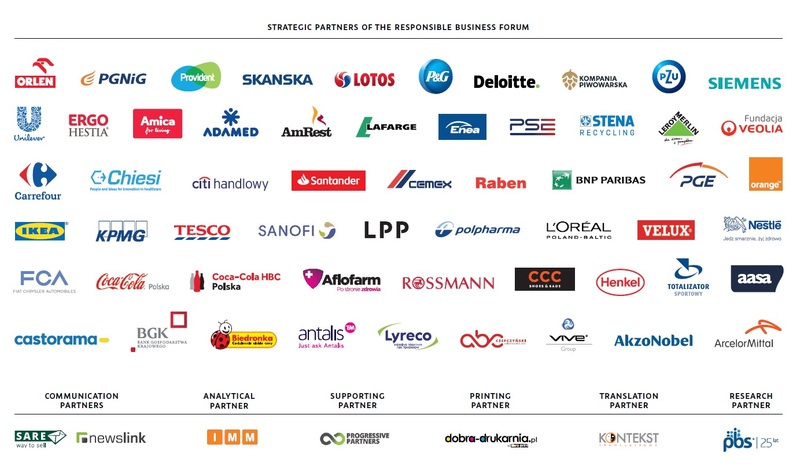 The Responsible Business Forum is the largest NGO in Poland addressing the concept of corporate social responsibility in a comprehensive manner, with the longest tradition in Poland, operating since 2000. The Forum is an expert organisation that initiates and partners in key activities for the Polish CSR. Strategy of management that helps to reduce the risk and maximise the chance of company’s prosperity in long term. Competency of managing the company in a way that enlarges its positive impact on the society and lower the negative aspect of business activities. The way in which company treats its stakeholders: clients and business partners, employees and local community. Forum co-operates with international organizations: CSR Europe, World Business Council for Sustainable Development, Global Reporting Initiative, Business in the Community, and CSR 360 Global Partner Network. Complex programme of cooperation with companies which, through their commitment and actions, contribute to the popularisation of the idea of CSR in Poland. The programme has been running for over 15 years and has included over 100 companies. Strategic Partners – companies which have considerable achievements in terms of responsible business, want to share their experiences as well as to support the development of the idea of CSR in the long term as well as to develop their activities related to this domain. In order to apply for participation in the programme, a company has to complete a form in which describes its actions related to CSR. On this basis, the Board of FOB decides whether to accept the company as a partner. Finally, consultations are conducted with current Strategic Partners. They have the right to object to the Board’s decision. Through the Partnership Program, RBF cooperates with companies – business leaders in Poland, committed to the promotion of responsible business through their policies and activities. Strategic Partners have the opportunity to participate in the following events: meetings (with an expert, thematic meetings), invitations to participate in debates as experts, CSR Leaders Club, CSR in practice, business breakfast, training courses and webinars, reports, surveys, newsletters. The first award in Poland for specific business actions undertaken to contribute to socio-economic and environmental change and to implement responsible business standards. Eligibility extends to anyone who manages CSR projects on a daily basis, to originators of particularly important initiatives, to representatives of state and local administration, market regulators and NGOs. The jury includes experts in various fields. RBF is involved in the work of the Panel on Corporate Social Responsibility operating at the Ministry of Economy. RBF and a representative of the Ministry of Science and Higher Education co-chair the Working Group for Education and CSR Promotion. RBF is among the main partners to the Polish Vision 2050 developed in response to the global initiative „Vision 2050. The new agenda for Sustainable Development” put forward by the World Business Council for Sustainable Development. The document sets out the key challenges and steps to achieve the objectives of sustainable development.